Barilaro sees nuclear future, Labor criticises lack of detail, Canberra Times, Elliot Williams – – 21 Apr 18, NSW Deputy Premier John Barilaro has not ruled out one day having nuclear reactors in his home electorate of Monaro, near the ACT. Mr Barilaro has garnered attention this week after advocating for nuclear energy to be considered in NSW in a speech to an energy policy forum in Sydney on Wednesday. But when questioned whether he would ever consider bringing nuclear reactors to Monaro Mr Barilaro refused to rule anything in or out. ……..Mr Barilaro said he envisaged a future where small modular reactors were set up in a series and could be air, gas or sand cooled rather than the familiar technology of large reactors situated on the coastline for easy access to water. He said recycling of radioactive material had improved and waste products would remain radioactive for around 300 years rather than hundreds of thousands of years. However Mr Barilaro has been criticised by Labor candidate for Monaro Bryce Wilson and the Nature Conservation Council for his reluctance to provide details about his plan to bring nuclear power to the state. “John can’t stand there and say he wants to provide relief to household energy bills without giving us any figures,” Mr Wilson said. “This isn’t primary school debating, this is a conversation for grown ups. “How can we have a conversation about nuclear power without knowing where reactors would go, how much it would cost and what would happen to the waste? 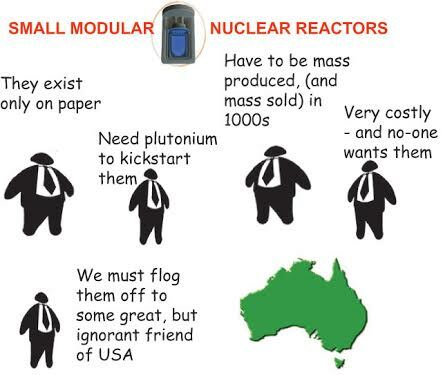 Mr Wilson added he would not endorse bringing nuclear reactors to any part of the region………The federal government has a ban on nuclear power in Australia and federal member for Eden-Monaro Mike Kelly said he would not support nuclear power in the region. “It is not necessary to build nuclear power stations in Australia, as we have an abundance of natural renewable resources that can be utilised to create energy,” Dr Kelly said. Mr Barilaro said he wanted to see more investment in renewable energy, particularly in Monaro, but said it would not be possible to do so without ensuring a greater baseload of energy, which nuclear power could provide. He said nuclear was a cleaner option than coal or gas to achieve the necessary baseload…….ACT minister for climate change and sustainability Shane Rattenbury ruled out nuclear power as an option for the territory. “Both Greens and Labor national platforms specifically preclude the construction of nuclear power plants in Australia,” Mr Rattenbury said. “Holtec HI-STORM UMAX canister storage systems and all other thin-wall nuclear waste canister storage systems are vulnerable to short-term radioactive leaks and potential explosions and criticalities. Each canister has roughly as much highly radioactive Cesium-137 as was released from the 1986 Chernobyl nuclear disaster. * No plan for failing canisters. Holtec proposes to transport thousands of US aging nuclear waste cans across the country to New Mexico and store them in an unproven HI-STORE CIS “Consolidated Interim Storage” facility,…“. See Handout: Holtec Storage System Designed to Leak. Holtec actually admits in a recent presentation that these huge canisters which may be up to 75 ¾ inches in diameter, and up to 213 inches tall are only 1/2 inch thick and the vented protective shell only 1 inch thick: https://www.nrc.gov/public-involve/conference-symposia/dsfm/2015/dsfm-2015-stefan-anton.pdf…..
American community concerned about long term dangers of giant casks of nuclear waste. Special vehicles are required to move the casks, as are specially built roads that can handle the immense weight. “We don’t know if this highly dangerous material will be there for another 100 years or a thousand years. if the casks are not moved in the coming decades, or even centuries, they worry about who would ultimately be responsible for protecting the nuclear waste. It’s unlikely, for example, that Entergy will still own the property, they say.